Paperback $7.99 (307 pages); Kindle $6.39. 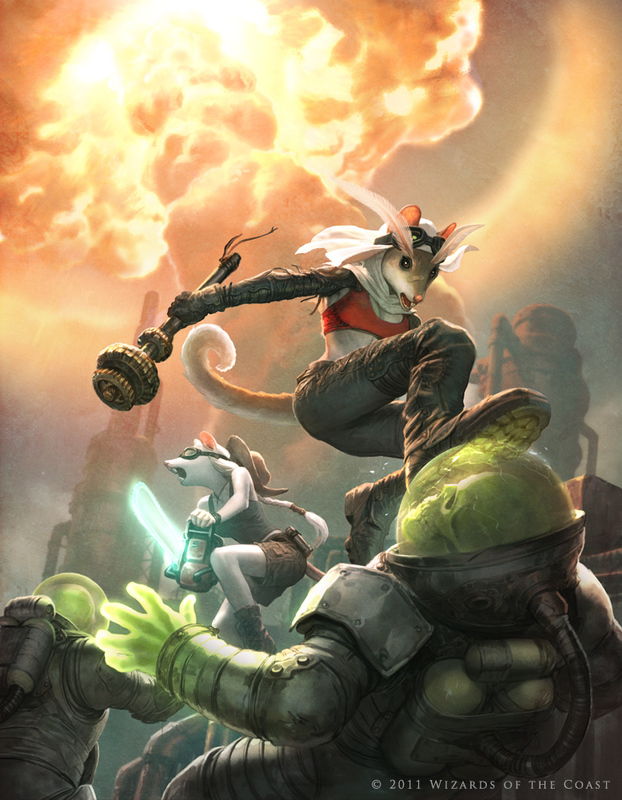 “Red Sails in the Fallout” is not just anthropomorphic, it is flamboyantly and bizarrely Furry. The tavern was also home to a number of female ‘dance artists’ who were not so much exotic as downright weird. Still, the lunchtime cat girl show always drew a steady crowd. The owner was an easy-going mutant crayfish, her bouncer was eight feet tall and sheathed in rock, and the waitresses could temporarily clone themselves during rush hour. As far as mutant humanoid animals went, Xoota was a fairly typical, fun-loving child of the apocalypse. She was a mutated quoll: a short, compact female figure dressed in sun veil and leathers. Xoota had the thighs of a rider, an archer’s muscles, and tawny fur covered in bright white spots. Across her belly, below the navel, she had a neat little marsupial pouch, and a handful of whiskers jutted from her scruffy muzzle. Her nose was pink, her ears long, and her prehensile tail often twitched in irritation. She wore a leather halter around her breasts, a ragged cloth around her head, and at her belt hung a mace made from metal cogs. A powerful crossbow rode across her lap. That’s not all. Xoota also has a pair of feathery mothlike antennae just above her eyes with which she can sense imminent danger. She rides Budgie, a giant flightless budgerigar in her searches through the dangerous landscape around Watering Hole for salvageable relics of the pre-apocalypse world. The rat girl was pure white and pink eyed, limber and full of guileless energy. Her features were very humanoid, despite a long, expressive tail and a pointed, delicately pretty rat face. She wore a cotton singlet, voluminous shorts with many pockets, and clunky work books. She used her meager cleavage to stow an ancient penlight. She had delightfully long, white hair plaited back into a ponytail. The rat girl planted her shovel in the salt, pushed a pair of spectacles up on her nose, and climbed happily out to greet her guest. Xoota also meets Wig-wig, a friendly swarm of mouse-sized earwigs with a single, empathetic hive-mind, in the wasteland. The quoll saves Shaani’s life and the rat girl promptly appoints herself Xoota’s Best Friend. It is very much an Odd Couple relationship. The grumpy Xoota is irritated by Shaani’s teaching Budgie to say, “Who’s a pretty boy, then?” and other parroty phrases, and Shanni’s noisy filing down of her incisors in the morning. But this is just incidental color. The real plot is about Watering Hole’s sole source of water going bad, and Xoota’s (and Budgie’s), Shaani’s, the Wig-wig collective’s, and Benek’s (a superciliously sinister human) three thousand kilometer trek on the windship ‘Sand Shark’ into the unknown desert – from which no one has ever returned – to fix the problem. 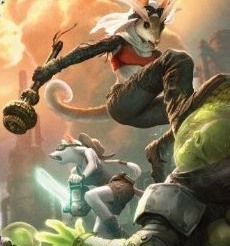 There are plenty of anthropomorphic gecko girls, frog men, cockatoo-riding razorback war pigs, and others around Watering Hole, and many adventures with more mutant plants and animals during our heroes’ quest into the unknown desert. Never read Gamma World books before, or really many of the different D&D setting books, but I did always find an interest in that rpg series - too bad the old rule books are difficult to find these days. To think that when I began buying s-f paperbacks in the 1950s, the average price was 35¢ or 50¢. $7.99 is now the norm for a "cheap paperback". Since public libraries tend to not get paperback novels, you had best bite the bullet and buy this before it goes out of print. By the way, I e.mailed this review to Paul Kidd. He replied that the publisher has edited out all of the snarky footnotes he had put into the text. The mutagenic properties of Omega ale would probably get it banned in any sensible society. Exported from “’Snappy’s Tavern” to many other villages, it was originally intended simply as a relaxing drink – leading the export kegs to all be marked “The Stuff That Refreshez.” Once the mutagenic properties were discovered, the local council insisted the motto be changed to “The stuff that can randomly alter your DNA, with possibly horrific results”. Fortunately, due to low literacy levels, this did not substantially reduce sales. Gods gain little respect amongst the denizens of the Westralian Desert. There are, however, a few legendary names from the past that are well revered. Darwin, patron of alpha mutation, and Oppenheimer, patron of bright ideas are the most popular. Enola Gay, patron of unexpected deliveries, also still enjoys a certain notoriety amongst caravan guards and those with two or more heads. All in all, the ancient gods are not taken seriously. Whoever the gods are, apparently none of them saw that Gamma Terra was coming. Ancient truck drivers, travelling to many lands, once carried the images of gods inside their vehicles. Scholars have identified many of these deities – including Wuff – the nodding-headed dog that watches out for dangers. Alo’ha, the grass-skirted goddess that made for happy home coming, and of course, the dice images that represent the gods of good fortune. The chrome images of naked women often found upon mudflaps are collected and revered by the most pious Sand Town residents. These chrome images, depicting as they do the naked female form, clearly represent the spirit naked before the great journey of life. The ancient truckers were obviously a pious and deeply philosophical breed. Aaah tea! This noble beverage, steeped in tradition, is still grown by the denizens of the Western Australis desert. The camellia bushes are lovingly fed and watered, then chased in a yearly round up and driven to market. Plucked and shorn, the plants are returned to the wilds, while the leaves are threatened, clubbed into submission, cured and dried. Tea comes in a number of distinct varieties: The most common are Black knobbly, Longhorn, Strontium blue, and Shaani’s favourite – Irish Breakfast with just a smidge of Beryllium 90. Water, of course, is the most priceless commodity in the desert. It defines trade routes – citizenship at ‘Watering Hole’ grants set rights to draw water from the village well. Swimming in a major water source can sometimes irritate the locals. At ‘Watering Hole’, it would be a faux pas. The giant Water Fleas from Darkfield Cistern, however, claim that their presence actually improves the flavour. Biltong: A delicacy generally made by lovingly laying sliced road kill in a vat of vinegar, roliling it in herbs, and then hanging it out to dry on the back porch for a few days. The resulting tasty treat can be used as iron rations on treks across the veldt. It also makes a handy kosh for self defence situations. A skilled hunter could theoretically bludgeon animals to death with lumps of their own preserved, marinated relatives. Is he stepping on an anthropomorphic tennis ball? It's good to see something other than canines or felines getting the limelight. Apparently the Large Hadron Collider is a popular source of concern. Gamma World's switch from a nuclear war to the LHC bringing the destruction produces a quite a lot of face-palming by some RPG fans I know working in related fields... but that is coming from WotC and not the book's author. Just finished reading the book and enjoyed it thoroughly. It's a rollicking good fun adventure, with lots of enjoyable silliness plus some real drama. I heartily recommend it.